Of course, rubber stampers may also like the idea of creating their own stamps. While there's a wonderful selection of rubber stamps available from craft stores in every size, shape, and style, sometimes it's just not possible to find the right stamp for a project. Yes, you could get a stamp custom made, however, there's something quite special about creating your own. If you're interested in creating your own stamps, here is a roundup of different techniques which you may find useful. On the following pages are gathered together some of the very best stamp carving projects and tutorials available. Hopefully, these will give you plenty of food for thought and will help you get started carving your own stamps, whether this is as a new hobby or simply to create a new stamp for a project. Dear Handmade Life shows us everything we need to know to create a cute handmade stamp. This one features the words "Thank You." This is a super-detailed photo tutorial and each stage is clearly shown. You could adapt this with your own words and sentiments. Visit the project page at Dear Handmade Life to learn more. This tutorial from Your Wish Cake shows us how to carve a stamp from a cork. This is a really clever way to make a low-cost stamp. The texture of the cork adds some interest to the finished stamped image. For more information visit the Your Wish Cake website. This tutorial from A Beautiful Mess shows how to transfer images onto the surface of your carving block using a technique which uses freezer paper. This is a handy technique to know, particularly if you want to use more intricate or elaborate designs. You will also find plenty of information about the whole process of stamp carving. This tutorial made me think that this would be a great technique for people who sell their own handmade items on places like Etsy, to learn, as they could carve stamps to decorate tags to reinforce the handmade nature of their products. To learn more about this technique and stamp carving, check out the detailed tutorial at A Beautiful Mess. One of the great things about stamp carving is that you can create stamps from a variety of materials including cheap erasers, lino and special carving material which has been designed specifically for use by stamp carvers (it is softer to use than lino). This tutorial from Vitamini Handmade explains how to carve stamps from carving block and shares hints and tips for creating stamps which will give perfect stamped results. For more information visit the tutorial at Vitamini Handmade. 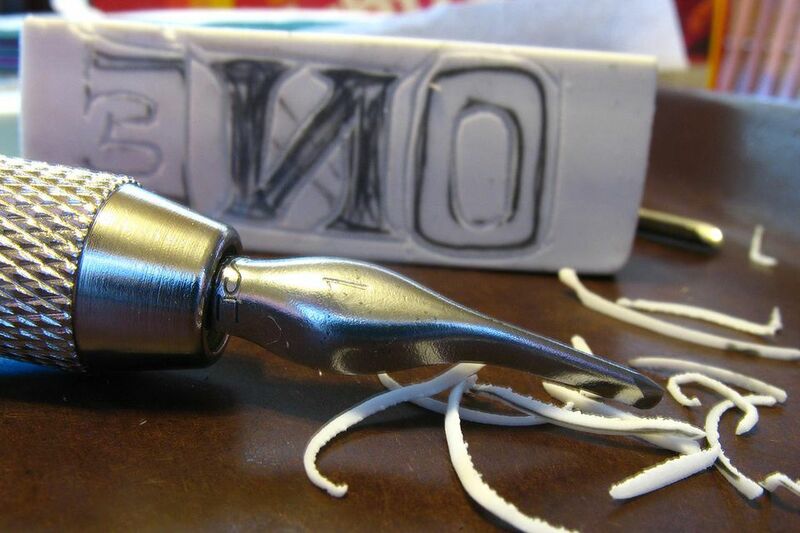 In this tutorial, Reg Silva from Wedgienet shows how to carve a stamp from an eraser. The tutorial includes everything from designing your stamp through to how to transfer the image plus lots of hints and tips about carving as well as information about the tools to use. This is a great resource for beginner stamp carvers, particularly those wanting to draw their own designs. For the complete tutorial visit the Wedgienet blog. This is a lesson plan from Lime Green News and provides all the information someone needs to start carving their own stamps. Because this is a lesson plan, there is loads of information about everything related to carving stamps. This is a very detailed tutorial which will be useful for crafters, but also a great resource for schools and home schoolers. This is a good introduction for young people to learn more about the craft of stamp carving. Visit the Lime Green News stamp carving lesson plan for more information. This tutorial from Mandy Russell shows how to carve a stamp with large open spaces. In this example, she's carved a window. Find out more at the Mandy Russell website. This tutorial from Daisy Yellow explores how hand carved stamps can be used as a way to decorate journals. This tutorial shows how to carve stamps with designs for stamping repeat patterns over a journal page. This is a really interesting exploration of another way that hand carved stamps can be used. You will find the complete tutorial on the Daisy Yellow website. This tutorial shows us not only how to carve a pineapple stamp but also how to use it to decorate a fabric lunch bag. For more information go to the Think Crafts blog. This tutorial from Anna K. Originals shows us how to carve a stamp which features text. While this looks pretty fiddly, the end result is great and this is ideal for times when you are looking to share a special message. This could also make a great stamp for people getting married and they could use this to stamp onto the invitations, wedding stationery and more! Find the full tutorial at Anna K. Originals website. This tutorial from Nittybits shows how to carve a stamp from stamp carving block. You'll find lots of tips and advice to get you started. Find the full stamp carving tutorial at Nittybits. This tutorial from Mollie Makes shows us how to carve a stamp from an eraser using an X-acto knife (or any similar type of knife would work well) and a V cutting tool. This tutorial includes hints and tips for drawing a design for your stamp and how to transfer it to the surface of the eraser. Visit the Mollie Makes tutorial for more information plus more cute photos showing hand carved stamped images. This is a really great tutorial from Clare Buswell showing how to carve a squirrel stamp. This squirrel has a large solid body and Clare shows how to get detail onto the body and tail of the squirrel which creates a much more pleasing and artistic effect than if the body was left as a solid mass. Find the full tutorial on Clare's Blog. This tutorial is for more advanced stamp carvers, or people looking for a challenge. One slip of the knife and your text is no longer clear! Learn how to make a detailed typography stamp at This Is Just To Say. The 3 Rs blog has a great idea for beginner stamp carvers. This origami effect elephant is relatively simple to carve with its long straight lines. This design could be adapted in a variety of ways. To learn more visit the 3 Rs blog. This is a great idea for a teacher appreciation gift from House of Handmade. Many teachers like to use stamps as part of their classroom communications. It's a great way to add a motivational word or two to some homework or class project (or perhaps as a reminder to try harder). Making hand carved teacher stamps as teacher appreciation gifts is certainly something a little different. These are attractive gifts which are handmade and practical. What teacher's not going to love that! Find the full tutorial at House of Handmade. Stamp carving is a great way to create your own unique stamps, as you have seen in these pages. Whether you use erasers, lino or soft block made for stamp carving, this is craft is accessible for everyone!